Now you can see information about Windows Phone (WP) Mango smartphones and WP jailbreak everywhere. Many WP smartphones from different companies are now available on the market. This post tries to help you make a right decision if you want to buy a WP smartphone. We will compare several smartphones (HTC HD7, HTC Mozart, HTC Trophy, HTC Surround, Samsung Omnia7, Samsung Focus, LG Optimus7) on different criteria (design, screen & video, camera, music, battery, call & sms, performance). About the design, different person may have different feeling. It’s fine as long as you like your choice. HTC Mozart: this unibody phone is small and neat. This phone is good for women. HTC Trophy: as small as Mozart but it looks more manly and rather heavy. HTC Surround: a unique WP smartphone from HTC. This smartphone has big and awesome speakers. It is rather thick. The back side is made of soft plastic. This phone is very good for entertainment and gamming. Samsung Omnia7: one of the best WP smartphones. Since it is covered by dark brown metal, it looks glossy. The screen size is big enough. Many people say that the front size is beautiful but the back size is not. Samsung Focus: not as good as Ommia7 but it has its own features. It is very light, the lightest WP smartphone so far. It is good for women. LG Optimus7: the design is neat and manly. It looks very strong because it is covered by hard mental. Screen is one of the most important criteria we need to consider when buying a smartphone. Most of WM smartphones have good touch screens but the quality of the screens is rather different. HTC HD7 (7): its 4.3” screen is good for entertainment but bad for displaying the details. The image looks not very sharp on this smartphone. You can see some aliasing effect on the character boundaries. HTC Mozart (9): very good, nothing to complain. HTC Surround & Trophy (8,5): similar to Mozart. Samsung Omnia7 & Focus (7): the quality of these Samsung smartphone is not good as expected. You can see the low quality images when reading text. LG Optimus7: (8,75 ) very sharp. HTC HD7 (6): not good, not real. HTC Mozart ( 9): very good. HTC Surround & Trophy (8 ): OK, not excellent. Samsung Omnia7 & Focus ( 8 ): very colorful, maybe you feel it’s not real in some cases. The black color is perfect but the white color looks not pure. To watch movies or view photos: the screen of HD7 is awesome. If you want colorful screen, choose Samsung Omnia7 or Focus instead. If you want a real color screen, choose HTC Mozart, Trophy, or Surround. To surf internet: don’t choose Ommia7 or Focus because the text looks not very good. The HD7 is the best because it has a big screen. 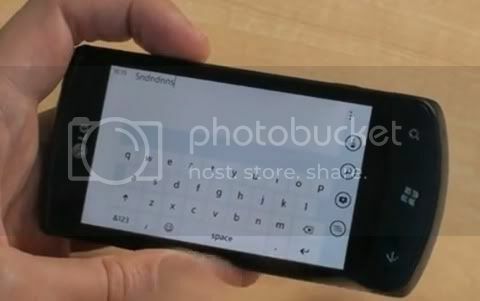 Camera of WP smartphones is not good. The good thing is the speed is rather fast. 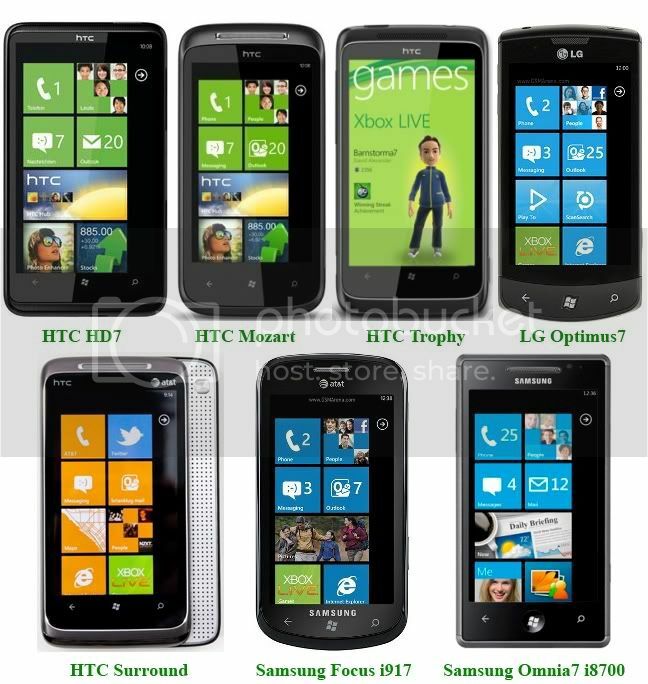 Not much different among these WP smartphones. 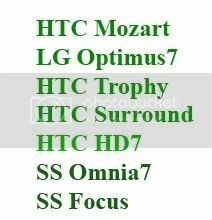 HTC Surround has the best speakers, the bass sound is very good > Ommia7 & Focus (good) > Mozart, Trophy, HD7 (medium) > LG Optimus7 (the sound of outside speaker is very small but very good when hearing with earphone). The battery is enough for using in a day long. If you only use for calling, HTC Mozart & LG Optimus7 (2.5 days) > HTC Trophy & Samsung Omnia7 (1.5~2 days) > HTC HD7, HTC Surround and Samsung Focus (1~1.5 days). All WP smartphones provide good quality of calling. SMS on WP is awesome. The virtual keyboard is very good and convenient. The WP (now) may be not as good as iOS and Android but it is very stable. Errors rarely occurs. The processing speed of these WP phones is also very good. The minimum requirements for WP smartphone are: 1GHz processor, 8GB built-in storage. There is no delay among tasks. Each phone has its own advantages and disadvantages. The design is different among smartphones. This post only gives you some personal opinions about these smartphones. Maybe you will have different opinions. Good luck with your choice.